Swedish ballads… mmmm…. they are like filled chocolates – the question is how many you eat. I guess I can take more than many others but my limit of nausea is just north of Haparanda. 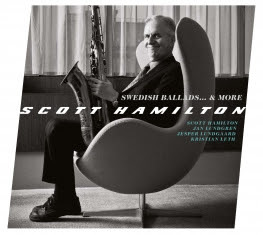 The American saxophone player, Scott Hamilton, has played with his Nordic quartet for some years now. The Swedish piano player, Jan Lundgren, is a prominent member. His influence in the direction of the Swedish ballads has played a large role on the new album from the quartet. I have the album Ballad Essentials from 2000 with Scott Hamilton – an album I have often enjoyed. It’s a compilation of ballads from the many releases since 1977 on Concord Records. When I listen to that album, it’s clear that Hamilton is able to do something with the saxophone-ballad just like Ben Webster could. Hamilton is something special. I’m easy to please when Scott Hamilton chooses to include Quincy Jones’ Stockholm Sweetnin’ – one of my all time favorites on his Swedish album of ballads. He also does Dear old Stockholm, Olle Adolphssons Trubbel and Jan Johanssons Blues i oktaver. But Scott Hamilton doesn’t surprise me. He is just as reliable as the sensible men’s shoes he’s wearing on the otherwise cool cover. The picture is taking in the famous room 606 at Radisson Blu Royal Hotel where the inventory still is intact with all its design furniture from Arne Jacobsen. The furniture comes from the same period as most of the melodies, so it’s quite appropriate. The Danes Jesper Lundgaard on bass and Kristian Leth on drums rounds up this quartet. It’s Hamilton’s third ‘Danish’ album, with Leth as a friend on all the albums. Swedish Ballads is my favorite amongst the three albums. The reason is the clear and original idea in the selection of the materiel. It’s a cozy album with rock solid material and some very fine details.